Every single person who works in a company or any other place has one common question that is “why does Monday come?” It is very common to feel awful about Monday, the starting day of every week. The problem is not that it is Monday, but actually the problem is that the Monday always comes when the weekend ends. A thought of Monday makes people stressful and frustrated only because of its position as an ending day of every single weekend. 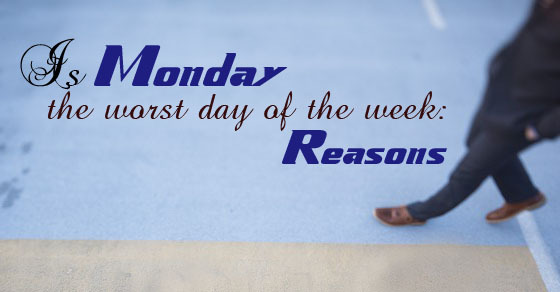 Why Monday Is the Worst Day of the Week? People working in an office, work according to their assigned duties throughout the days without proper sleep. The normal working days starts with early morning shifts and ends very late, this makes them think that if they are working hard all these days then they can enjoy their weekend peacefully. But the main mistake that people make is that they take advantage of their weekends through their sleeping patters. By keeping fixed sleeping patterns one can start taking Monday as one of the normal days of the week. A working place should be comfortable for all the employees of the company. Being a human being it is our nature that we need to communicate and build our own group of people who shares the same interests and hobbies. And similarly in an office a person feels comfortable with his / her fellow workers. Therefore, every starting day of the week makes a person ignore all the tensions of the office by his / her friends gossips. Monday gives a certain change to the weekends. This kind of sudden change makes people irritated of facts that they spent their weekends so cheerfully and all of the sudden again this Monday they have to start working as usual. This kind of change makes people go furious on Monday’s. That’s why Monday is considered as a most stressful day of the week. It’s not that a person only works for Monday and the rest of the day, he just relaxes. Its because Monday is the only day that comes just after the weekends and after Monday the rest of the days goes in a very relaxed manner. As mentioned earlier, a working person works in an office day and night without thinking anything. And at the end of the weekends he / she feels relaxed, even they start taking their health granted and ignores all the healthy routines they followed in those working days. This makes them feel less attractive on Mondays because they eat or drink out of their limits as compared to the normal working days. And eventually they start hating Mondays for their own stupid mistakes. As far as the Monday is concerned, working people tend to feel worse on Mondays because of their own reasons. Whenever weekend comes people start taking their health granted. Because of constant work routine an employee takes good care of his / her health during the rest of the day except on Mondays. Mondays are considered less healthy because of weekend fun. Every weekend an employee tries to enjoy all those things which he / she ignored throughout the week thinking about work. Therefore, whenever Monday comes people feels less healthy because of their unhealthy habits. The reason behind the hate regarding Mondays is that some people hate their job for their own reason. It is possible that the work they deliver in their office is not what they always wanted. Sometimes it happens that some people end up working in a company which they don’t deserve. But still they have to work in that company without any complaints until they find their dream job. And this kind of hate for one’s job makes them hate Mondays as its the first day of their most hated work. The most likely reason for such hatred towards Monday would be because of bosses. If a person is asked to give their opinion about their office environment, then the answer seems positive, but on the contrary, when that same person is asked about his / her boss at that time he / she feels very irritated to talk about it. And it is very common to know that most of the working people hate their Mondays because of their bosses. Sometimes it happens that a person who is enjoying his / her weekend keeps thinking about how it’s going to come to an end and Monday is going to end all the funs. This kind of constant thinking can ruin weekend fun. Instead of thinking about coming Monday’s, one can at least enjoy the presents weekends. A person who slept very calmly previous night won’t be so irritated to get up normal and treat that particular day very normal. When a person comes out of a weekend zone and try to be prepared for coming Monday at that time everything seems difficult. Every Monday morning whenever a person thinks of getting out of bed, it seems as if there is some kind of gravity which pulls you back to the bed. It seems strange but its like hangover which doesn’t leave you until you won’t try to get out of it. It’s not just some people who get so irritated of the Mondays. According to some research, 90% of people who are working somewhere feels really lazy on Monday mornings. Therefore, most of people would be frustrated on every Monday morning and that’s why no one smiles on Mondays. This frustration Monday can turn that whole day very bad and irritating as possible. A working person hates Monday as much as they love weekends and sometimes even more. As we all know that a life of an employed person is a life full of deadlines and meeting which is a never ending process. Nobody wishes to go back to that particular life full of deadlines and meetings, but its just a normal life process which should keep moving without any trouble. Therefore, to avoid such unwanted feelings a person should start taking things in a positive way. A person who works more than hours to deliver his / her assigned duties will expect that he / she will have complete fun in the coming weekends, but doesn’t happen as its planned. There may be some kind of problems which will always show up during office hours. Therefore, to avoid such kind of experience regarding Mondays, a person needs to treat all the days of the week same so that there won’t be any difference if anything happens on those days. To end this discussion, we would suggest every single working employee that instead of going crazy over a day and making hard to understand why is that so hard to adjust to the fact that Monday is just a normal day as compared to the other days of the week. Once a person starts balancing all the days of the week equally, then there won’t be any kind of extra issues with the Mondays. Therefore, to overcome such kind of anger over a single day, which works very normal as compared to the other days of the week one needs to minimize weekend fun just to accept coming Mondays with a warm and fresh thinking. If a person starts taking all the days of weeks equal, then there won’t be any kind of difference of opinion about the other days of the week.